MAXRITE 700 is a single component, cement-based, microsilica and polymer-modified, fiber- reinforced restoration mortar with corrosion inhibitors. It is specially designed for high performance structural concrete repair exposed to an aggressive environmental ambient and provides an additional protection of the steel reinforcements. Its long open time and thixotropy allow the repair of new and old concrete in a simple way, without the need for using any form work, applied manually or by mechanical means. Its open setting time allows the quick completation of the repair of large surfaces. Good chemical resistance in aggressive environmental ambient due to its microsilica content. Offers high resistance to carbonation penetration. High adhesion to concrete and reinforcements. Does not require special primers. Loads are transmitted onto the repaired structure. High impact and mechanical strength. Long lasting repairs. Good thixotropy. Application in successive layers without slump or the need to use form work. Allows high thickness per layer. Easy workability and application. It can also be sprayed by wet method. Single component mortar. Only requires water for mixing and it is odourless, making it suitable for poor ventilated areas. Remove all damaged and loose concrete in the area to be repaired. Clean cut the edges perpendicularly to a minimum depth of 5 mm. Expose all corroded reinforcement, removing all the concrete until the edges of the bars are not affected by rust. Remove concrete all around the reinforcement for an efficient cleaning and to surround it with a minimum thickness of at least 1 cm. of MAXRITE 700. Eliminate rust by wire brush, needle gun, sand or shot blasting, etc. For additional protection, an application of the oxide converter and protector MAXREST PASSIVE (Technical Bulletin Nº. : 12) can be used. Prior to application of Drizoro Maxrite 700, dampen the exposed surface until saturated but do not leave free-standing water. Drizoro Maxrite 700 is mixed exclusively with clean water, free from contaminants, either manually or mechanically by low speed drill (400 – 600 rpm). One 25 kg. bag or drum of Drizoro Maxrite 700 requires about 3,75 to 4,25 litres of water to achieve proper consistency of a repair mortar (16% ± 1%). For applications using pump or spray machines the mixing water can by increased up to 4,5 litres per bag. In any case these quantities are only indicative and should be checked depending on the desired consistency and the existing ambient conditions. For an optimum bonding prepare a slurry, mixing 5 parts of Drizoro Maxrite 700 with 1 part of water, mixing thoroughly until a homogeneous consistency without any lumps is achieved. Apply the slurry using a MAXBRUSH type brush on the surface to be repaired and on the reinforcement bars, filling all voids and pores. While the slurry is still fresh, start placing Drizoro Maxrite 700 with the consistency of a repair mortar and apply layers between 5 and 50 mm. thick. Place special attention in pressing with the trowel to prevent any air from being trapped. Mark or scratch the surface of each layer with the trowel to improve the adhesion of the following coat, which can be placed after about 30 minutes. Shape the last layer as desired before the final hardening occurs. Do not apply below 5 °C or if lower substrate or ambient temperatures are expected during the 24 hours following the repair. during the first 24 hours if the temperature is above 30 ºC and the relative humidity is below 50%. Tools and equipment should be cleaned immediately with water after use. Once it sets can only be removed by mechanical means. Fills 0.54 litre/ kg of Maxrite. • If the slurry primer dries up, or the previous layer is completely set, apply a new slurry coat to continue the job. any Drizoro Maxrite 700 leftovers to prepare a new batch. mixing methods which cause violent mix and do not mix for prolonged periods. using curing compounds on the repair. exceed the thickness per layer in application. exceed the amount of mixing water recommended. The setting time is measured at 20 ºC, higher temperatures reduce setting time and lower temperatures delay setting time. For any other application not specified in this technical bulletin consult our Technical Department. 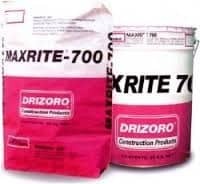 Drizoro Maxrite 700 is supplied in 25 kg. bags and drums.